Here's an interesting look at different types of workplace learners from the Great Leadership blog. Doesn't know a lot and doesn't really give a damn about it. That's not always a bad thing. For example, I don't know a lot about art history and I really don't care to learn about it. However, for a manager, being unskilled in leadership and not wanting do do anything about it is a recipe for failure. These managers are often stuck in their own comfort zone, over rely on a few key strengths and will justify their behavior by saying things like "hey, that's just the way I am". They won't seek out feedback, ignore it if they get it, and are seen as unwilling or unable to adapt. Being "retired on the job" isn't about age - I've seen it happen to as many younger managers as older ones. These are often the managers who "get sent" to leadership training or have a coach forced upon them. Without a willingness to learn, the chances for behavior change are slim. 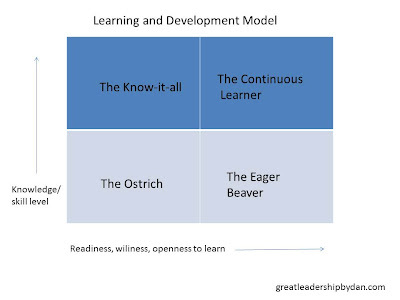 Eager beavers are often new in their roles or are in a situation where they need to learn something new in order to be successful. In other words, their jobs depend on it. I love working with new supervisors - they just soak up anything you offer them. The problem is, they sometimes are a little too eager, and try to take on too many new skills at once. They can come across as not genuine, lack consistency, and are prone to lose their confidence. They can also be gullible - being an easy target for the latest fads or silver bullets promising to make them great leaders in 10 easy steps. Continuous learners are always looking to improve, no matter how good they are. In sports, they're the Tom Bradys, the Peyton Mannings - superstar all-pros, but always the last ones off the practice field and putting in overtime studying film of their next opponent. They are the David Bowies, the Madonnas of rock and roll, always looking to stay current and relevant, and knowing when it's time to reinvent themselves. Continuous learner leaders seem to be naturally curious and outstanding listeners. They are not faking it - they really do feel that they can learn something from everyone. They are not afraid to admit their weaknesses, and openly share their development plans to address those weaknesses. They are always seeking feedback, and seem to know how to take that feedback and adapt their behavior accordingly.